While the city of Isfahan, has a dry climate and located at the edge of the desert, there are a number of gardens, beautiful roses, and shades of trees in the city. In addition to numerous historical sites in Isfahan which always visited by tourists when they travel to Isfahan, there is a small, beautiful palace at the center of the garden, called Baghe Bolbol. According to Iranian culture, and literature, gardens are a small symbol of the promised paradise, and therefore, you can see lots of gardens in each city in Iran, you travel to. It is popular among people to say that, the Hasht Behesht Palace, is the entrance to the promised paradise. The Hasht Behesht Palace (literally means Eight Palaces in Farsi) is a unique garden pavilion, actually, one of Isfahan's two surviving Safavid pavilions, the other one is Chehel Sotun Palace. These pavilions are different in style, but both of them exhibits the same concern for the interplay of interior and exterior spaces. The Hasht Behesht Palace was built at the center of Baghe Bolbol (The Nightingale Garden) in 1660, during Shah Suleiman Safavid. The palace was renovated by Fathali Shah Qajar in the 19th century. And it was used as a residential palace by Zele Sultan (Fathali Shah’s son). Unfortunately, during all his residency at the palace, he did not pay any attention to the maintenance of the building. 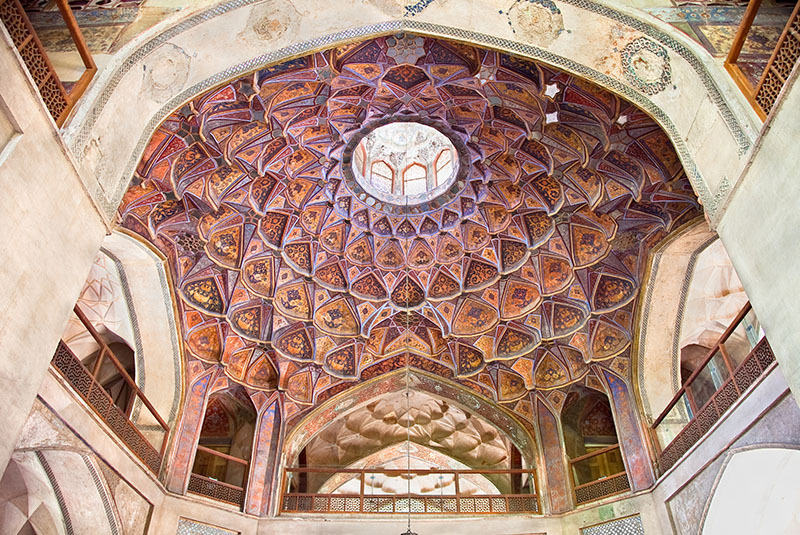 Along with the Ali Qapu and Chehel Sotun, the Hasht Behesht was restored by IsMEO - Istituto Italiano per il Medio ed Estremo Oriente for NOCHMI - National Organization for Conservation of Historic Monuments of Iran. The project, completed in 1977, received an Aga Khan Award for Architecture in 1980. Today the garden is used as a public park and opens to the public. The palace has also become a museum and visitors can have a visit of it during its opening time. Hasht Behesht Palace refers to a Timurid palace building type consisting of two stories of four corner rooms around a central domed space. The corner rooms are octagonal in shape, and forming massive pillars that define four large openings leading to large porches with wooden ceilings on the east, north and west facades. The south facade is punctured by a vaulted Iwan. 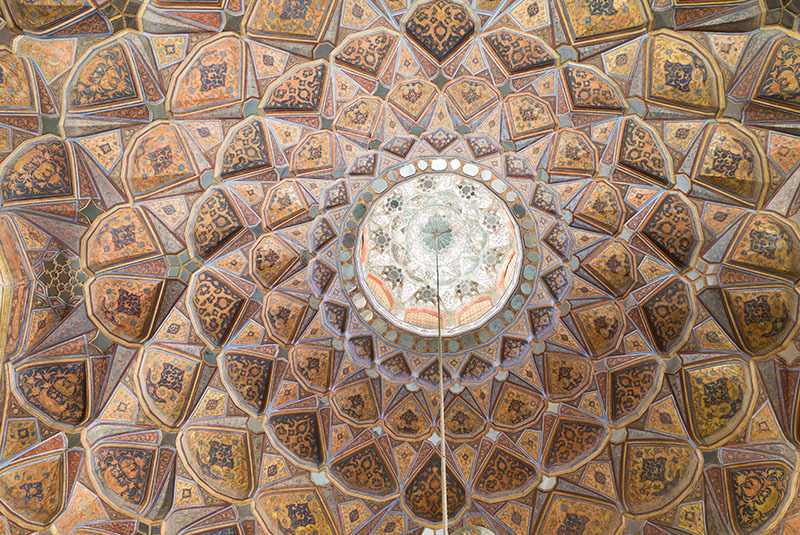 The vault of the central space is detailed with polychrome muqarnas and is capped with a lantern cupola. The openness of the pavilion to the exterior, with large open archways and the top-lit domed space, is enhanced with a fountain positioned under the dome. In the center of domed space, there is an amazing marble octagonal pond, known as the Pearl Pond. The pond is carved so that water will leak from the spinnerets like pearls. During hot summer days, circulation of air and wind, cooled by surrounding water streams and beautiful plane, and sycamore trees created a nice comfortable environment for residents. The original palace was decorated with beautiful gilded mosaics, mirror work, plasterwork, and various kinds of floral paintings on plaster. Especially ceiling of the palace was ornamented with a variety of plastered pendent decorations. Nineteenth-century engravings reveal that the interior was once covered in tiles and wall paintings that have since been removed. Some of the original mirror mosaics remains on the vault. Visiting days and hours: Everyday, from 9:00 AM, till 4:00 PM.